Stephanie Brody-Lederman’s art is a kind of visual poetry of souvenir and suggestion, hinting at its subject matter in evocative words and phrases, and in plainly drawn, iconic motifs–chairs, lanterns, boats, bugs–sprinkled over color saturated grounds. A veteran of the New York art scene, Brody-Lederman has never jumped on a market-driven bandwagon, nor do her paintings, mixed medium artist’s books and assemblages fall easily into stylistic categories. This small show brought together several dozen recent works. Brody-Lederman often combines mediums and materials to see what kinds of unexpected textures they may produce. 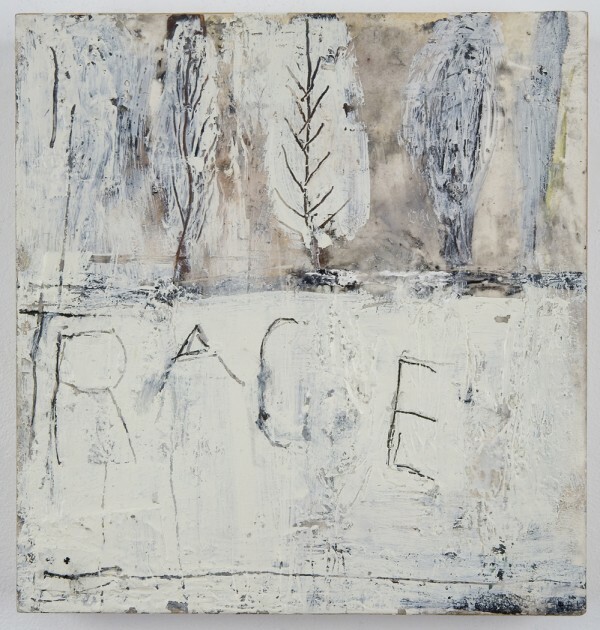 Her use of crackled-paint effects and of words that seem to float in generally austere compositions helps evoke time and memory as ongoing themes. Such is the case in Trace (graphite and encaustic on paper, mounted on birch panel, 2004), whose title is etched in a thickly impastoed white background. In I’m On Edge (I Miss You), 1996-2003, a large moody painting in oil and alkyd on linen, an empty straight-backed chair hovers in a distant dark blue sky, and is seemingly engaged in a silent dialogue of longing and loss with an empty armchair plunked down in a broad foreground of brushy, daubed colors. (In fact according to the artist, this work alludes to her deceased mother. In the small, ambiguous Pont Mirabeau (Orange), in oil and acrylic on canvas (2006-2007), a leafless tree stands alone either on an island or rooted in a pond, whil in The Slow Sky (encaustic on wood, 2005), a floral shape rises out of a thick murk of wax the color of dirty snow. Brody-Lederman has noted that her works are inspired by impressions snatched from everyday life—a snippet of conversation overheard here, a memorable gesture or object spotted there. Like stones thrown into a still pool, causing the surface to ripple’ these saved revisited observations serve artist and viewer alike as starting points for mental and emotional meanderings.